Experiments are one of the best ways to learn about science. Even if you're not physically doing the experiment yourself, watching and seeing science in action is so much better than just reading about it from a textbook. Recently, I was given the opportunity by Library and Educational Services to review two volumes from the new Go Science DVDs series. Library and Educational Services is a wholesale distributor, and homeschoolers qualify as a wholesale buyer. You do need an account to browse and shop, but you can receive steep discounts on curriculum, books, DVDs, audiobooks and a multitude of other resources for your homeschool. As part of the review, we were given the choice of which two Go Science DVDs from the new series that we'd like to receive and review. 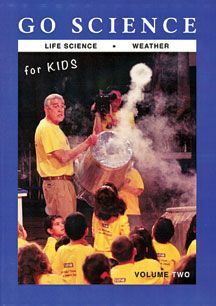 We chose Volume 2 - Life Science and Weather which includes two sections - Life Science and Weather. Life Science includes seven demonstrations and Weather includes five demonstrations. It has a running time of 1:02. Life Science goes with some other topics we're learning, so it was a good fit. We also chose Volume 7-Engineering, Design and Flight because Elliott is very STEM oriented and I knew this would appeal to him the most! This DVD also includes two sections. Engineering/Design includes seven science demonstrations. The second section, Flight, includes four demonstrations. It has a running time of 56:09. Each science demonstration is contained within a short "segment" running only a few minutes each. They are all led by Ben Roy. Some interesting credentials for letting Ben Roy come into your home and teach science are that he has taught science methods at The University of Tennessee-Chattanooga and produced science lessons for the Weather Channel and a Christian satellite broadcasting network. The segments start with Ben Roy talking to a group of kids. He calls two or three children by name, asks them a question or two about themselves, and then asks them to be his helpers. 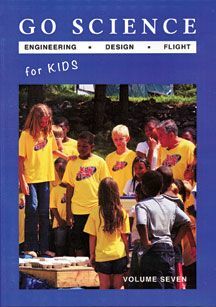 For instance, in the segment titled The Leaning Tower of Lyra (from Volume 7-Engineering, Design and Flight) he asks the kids what they like to do or have done that requires balance. Then he has the three kids balance a piece of wood on their fingers. Then they have to work together to complete a slightly more involved activity that demonstrates balance and center of gravity. Usually he will tie the science lesson into an event from the Bible or scripture, but it's very brief and simple, and I didn't really find it "preachy" at all. At the the end of every segment he will say "Every time we learn something about science, we learn something about our Creator God!" Elliott is interested in science and enjoys experiments and demonstrations, so I had a good feeling he would enjoy these videos. He immediately jumped on the couch to begin watching. What I loved was that I was hearing things like "Hey momma, did you SEE that?" or "I want to try that!" with a big smile on his face after almost every experiment. That is the beauty of this series. Immediately my son was engaged and was wanting to get hands-on and experimental, and that is how you learn! I've been a little too under the weather with the first trimester blahs to do anything more than watch the videos, but I'm hoping in the next few weeks to re-watch and work through these with Elliott! As a mom, I appreciated that many of the activities could be safely tried at home with common materials. I would have liked if there was a list of supplies made available (either as an option in the on-screen menu, or even as an insert in the DVD case), because otherwise you have to watch each segment to determine what is needed. However, we also liked that some of the demonstrations were things we couldn't realistically try at home, because it's always fun to watch those "COOL!" demonstrations! The DVDs are recommend for ages 4-12. That's a big age range for any group activity, let alone science, in my opinion, and I wasn't sure how it would hold the attention of my 4 year old while still being engaging and informative enough for middle school aged children. Emory is 4, and he tuned in and out of the segments, but a few things caught his attention. I think he liked the actual demonstrations, but didn't care for the talking before or after. My 7 year old was fascinated. I think the demonstrations alone are enough to keep the attention of the full age range, but that there's *just enough* scientific information given to explain what is happening for the youngest viewers. Too much more information might go over their heads, bore them and cause them to lose interest. The length of the segments is perfect for them. However, I think older students are probably going to want more background or explanations. It might be a good opportunity to have them do some research and work through the scientific process. If they're interested in learning more about the whys and hows, then Go Science has done its job to inspire! Ben Roy's enthusiasm shows, and you can tell he's passionate about science and inspiring a love of science in children. 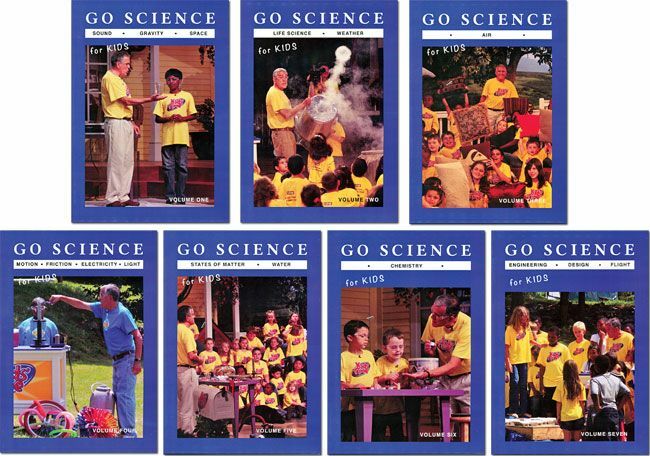 In addition to families and homeschools, I think Go Science would make a good series for an early elementary science co-op class, since so many of the demonstrations can be replicated. They'd also make great object lessons for Junior Church lessons as well. At just $8.97/each, these are a fun investment for a series of lessons. There are a total of seven DVDs in the second Go Science series, and the crew reviewed various titles, so be sure to check out the rest of the Crew Reviews for more information.